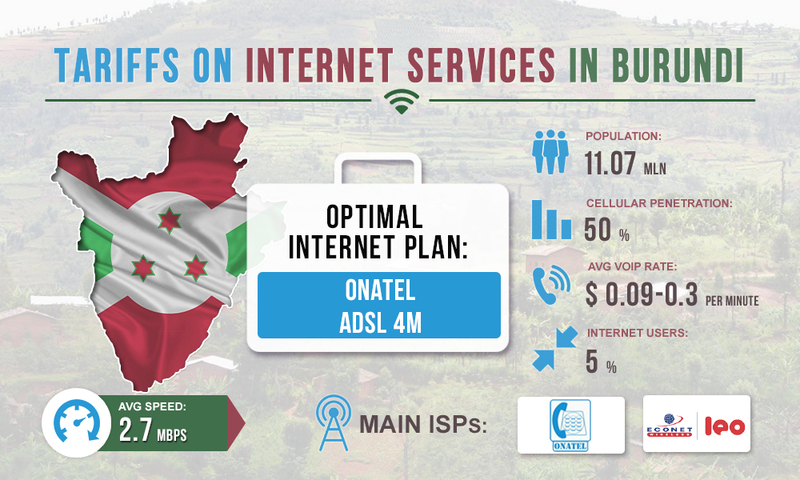 Although Burundi does not have the Internet service sector that is well developed, the situation is gradually improving. A national fiber-optic network is being created; in large cities, it is possible to connect high-speed Internet. But will the tariffs on Internet services in Burundi allow making good money on VoIP traffic termination? 512 Kbps. The cost per month is $7.14. 1 Mbps. The cost per month is $12.5. 2 Mbps. The cost per month is $24. 4 Mbps. The cost per month is $46. 8 Mbps. The cost per month is $88. 16 Mbps. The cost per month is $209. If you want your VoIP equipment operating efficiently, select the ADSL 4M Internet plan offered by Onatel (speed - 4 Mbps). Taking into account 42 Kbps for each port, this speed is sufficient for termination using multichannel gateways. To improve the bandwidth in countries with the poor Internet, you can apply useful voip business solutions. For example, GoAntiFraud offers the "SBO traffic optimization" software module, which compresses data three times, without impairing voice packages. This module will also be useful for terminators who work in regions with a non-banking Internet payment. In this case, SBO traffic optimization will save money and reduce business expenses for the Internet.